More than a year after Hurricane Irene ripped through the villages of Hatteras Island, two local food pantries are still managing to successfully meet the demand of the island and surrounding areas. Both local food pantries are in continual need of supplies and donations in order to maintain this level of support throughout the winter months. 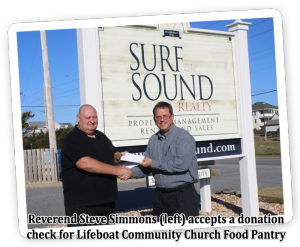 Surf or Sound Realty offices in Avon and Salvo continue to serve as year-round drop-off locations for both the Lifeboat Community Food Pantry in Salvo and the Hatteras Island Food Pantry in Buxton. Vacationing guests are asked to donate any unopened, nonperishable food items or unused supplies upon checking out of their rental homes. Steven M. Simmons, Pastor of Lifeboat Community Church, mentions that families come from all over to stock up on needed supplies. “We currently serve over 400 families,” he says. LCCFP is in need of nonperishable food items such as canned goods, cereal, and peanut butter. Food items that do not have to be prepared are in high demand due to the fact that many people are still without a means to cook. There is also a need for supplies such as toiletries, toilet paper, paper towels, and cleaning supplies. “This is as empty as our cupboards have been,” states Pastor Simmons. Vacation Specialist for Surf or Sound Realty, Peggy Gray, commented that donations are continuing to be made at a steady rate. “About one third of the guests donate items when checking-out each week.” Donations range from a few canned goods to two or three bags full of items and supplies, per family group. A.J. Baker, Maintenance Technician for Surf or Sound Realty, estimates that around 30-40 lbs. of items are donated each week by guests checking out of Surf or Sound’s Salvo office. 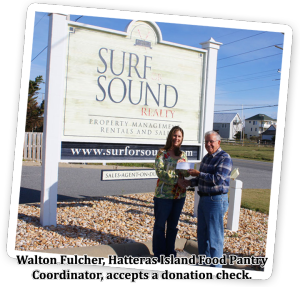 Hatteras Island Food Pantry in Buxton, run by the Cape Hatteras United Methodist Men, also serves the residents of all 7 villages and accepts donations on a continual basis. Residents in the community and visitors are encouraged to drop-off donated items for the upcoming Thanksgiving Food Drive at either our Salvo or Avon office locations. After Hurricane Irene, many Hatteras Island residents relied on donations from the two local food pantries and, as a result, the shelves were quickly depleted. Lifeboat Community Church Food Pantry in Salvo and Hatteras Island Food Pantry in Buxton are in need of supplies and donations to help residents get through the winter months. 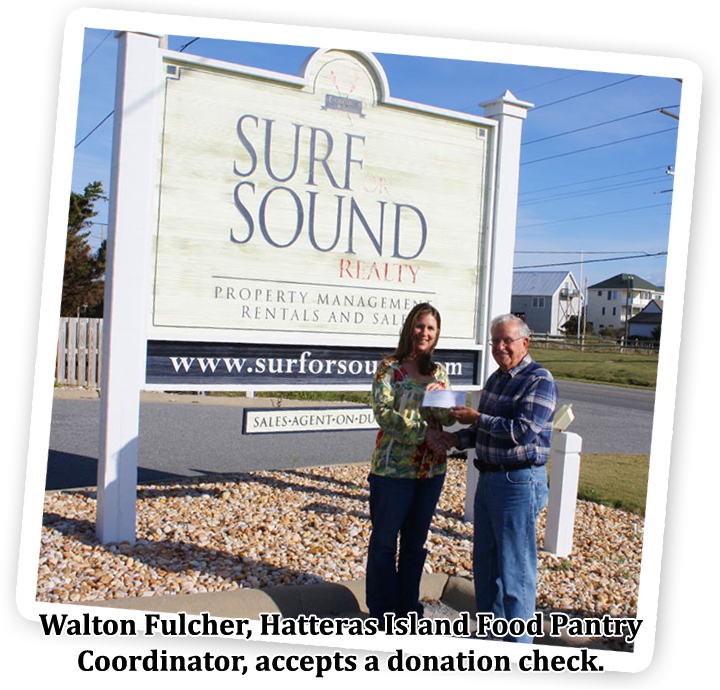 Surf or Sound Realty, located on Hatteras Island, recently donated checks to each of these local food pantries. “There are still a lot of people on the island in need in the aftermath of Hurricane Irene and we want to do what we can to help our community,” says Melvin Stone, President of Surf or Sound Realty. 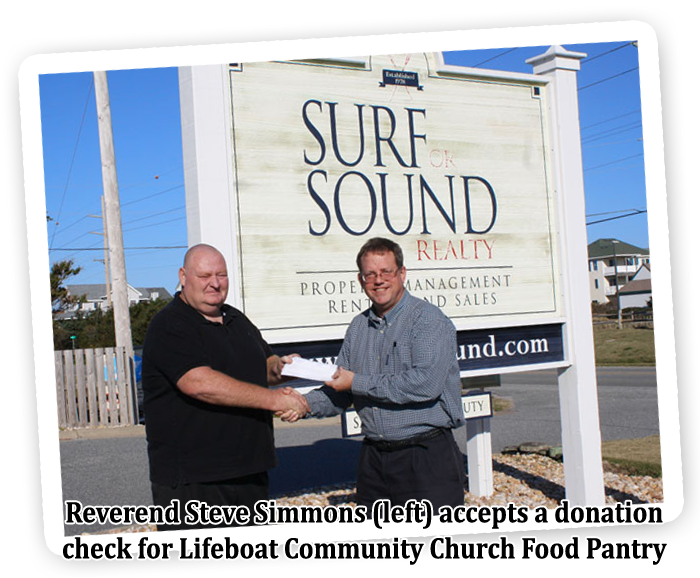 In addition, Surf or Sound Realty’s Avon and Salvo offices serve as year round drop-off locations for both food pantries. Weekly rental guests are encouraged to donate any unopened non-perishable food at the end of their stay, and many are more than happy to help. 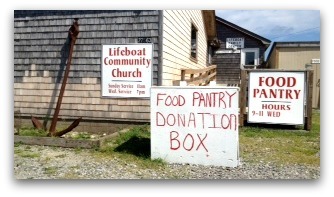 Lifeboat Community Church Food Pantry (LCCFP) currently feeds over four hundred families. Reverend Steven M. Simmons says, “We’ll feed everybody. We don’t turn anybody away.” LCCFP goes through about two thousand dollars a week in food and relies on monetary donations as well as donations from local grocery stores. “Our food pantry is having a hard time keeping up with the high demand right now. We sustained a significant amount of damage in the hurricane but still have had our doors open since days after the hurricane,” said Melinda Baker, Associate Pastor for Lifeboat Community Church. Monetary donations for the Hatteras Island Food Pantry can be made payable by check to United Methodist Men and mailed to Hatteras Island Food Pantry, PO Box 1591, Buxton, NC 27920. Monetary donations for Lifeboat Community Church can be dropped off at 27563 Highway 12 in Salvo, or by mailing checks to Lifeboat Community Church, P.O. Box 84 Salvo, NC 27972.